If you are looking for the fiercest compact SUV on the market, you can consider your journey complete because the 2019 GMC Terrain is ready to command the roads. The 2019 GMC Terrain goes even deeper than boldness though with a comfortably refined cabin and impressive technology options that will make any journey more enjoyable. Stylish by design, the 2019 GMC Terrain fits into every setting with seamless effort. Families of four will fit perfectly, thrill-seekers will have all the space they need for equipment and supplies, and professionals will have all the versatility they need to remain organized. Behind the wheel of a 2019 Terrain you’ll always feel prepared and comfortable. As far as performance goes, the size of the 2019 GMC Terrain makes it easy to handle while the engine options keep it proficiently powered with 252 horsepower and up to 3,500 pounds of towing potential. With the perfect balance of easy-to-handle size, respectable power, and efficient space, the 2019 GMC Terrain is a triple threat on the road. For comfort, the 2019 Terrain offers amenities like soft-touch materials, leather-appointed seating and steering that can be optimized to be heated, and a number of convenient solutions like flat-folding rear seating, keyless open and start, and hands-free iftgate. For entertainment, the 2019 Terrain comes equipped with a premium GMC infotainment system with and model above the first trim level. The touch display can be 7 or 8-inches and will include Bluetooth, Apple CarPlay, Android Auto, and voice-activated tech that will allow you hours of fun and reliable connectivity to the outside world. Receiving and making calls or texts will be as easy and efficient as your hands won’t leave the wheel and your eyes will never leave the road. You will also be able to access apps to listen to your playlist on the Bose premium speaker system instead of repeating the top 40 on the radio, and you can use maps, so you never have to worry about getting lost. For safety, it is all about awareness as the 2019 GMC Terrain uses sensor technology in order to quickly alert you if even the possibility of an accident is about to happen. Never again will you be caught off guard as you can choose to have this safety alert tech on the front, sides, and rear of the 2019 Terrain. These features are also helpful when you have some tricky maneuvering to do. Where you need comfort after a long day, entertainment as you grow frustrated in traffic, or safety as you drive the little ones to school, the 2019 GMC Terrain will have all the amenities for you. Considering how important it is to find an engine that best suits your needs it is important to have a powerful selection to choose from. The 2019 GMC Terrain is fitted with three engine options that cover a whole range of needs and driver preferences. These three engines can be separated into the standard, advanced, and alternative powertrains. The standard powertrain is a 1.5L turbo gas engine paired with a 9-speed automatic transmission that offers a balance of efficiency and power. With this engine, you will get 170 hp for respectable acceleration and 203 lb-ft of torque that can handle up to 1,500 pounds of towing weight. Additionally, you will get a max fuel economy rating of 30 mpg highway depending on whether you invest in an FWD or AWD model. If that just won’t satisfy your more adventurous side, you will certainly be impressed by the upgraded engine option. The 2.0L turbo gas engine paired with a fantastic 9-speed automatic transmission produces 252 hp for eye-opening accelerations, and 260 lb-ft of torque for 3,500 pounds of towing capability. The only possible downside to this option is the top fuel economy does drop just a bit to 28 mpg highway with FWD. The alternative option is sure to excite many SUV that has dreamed of an efficient diesel option. The 1.6L turbo diesel engine for the 2019 GMC Terrain offers delivers 137 hp and 250 lb-ft of torque which allows drivers the freedom to town up to 1,500 pounds. This is the most impressive fuel economy of the group by fair with a max of 39 mpg highway with the FWD and 38 with AWD. Due to automotive practically, this engine is paired with a 6-speed transmission instead of a 9-speed, but with everything, you will save on fuel that should hardly be a factor. One advantage many overlook with the 2019 GMC Terrain is its easy handling due to being the smallest GMC vehicle on the market. Not only can it handle crowded urban streets, but it also offers off-roading capability with its AWD model. If you get the AWD model of the 2019 Terrain, you will also get an advanced traction system has a drive model specifically for off-roading, but even if you get the FWD, you will get a drive mode for handling snow and colder conditions. There is also an electronic precision shift system that allows for easy adjustments right from the driver’s seat with a push or flip. In terms of what the 2019 GMC Terrain is truly capable of, it is almost easier to name what it can’t do since it is pretty much ready for anything you put in its way. 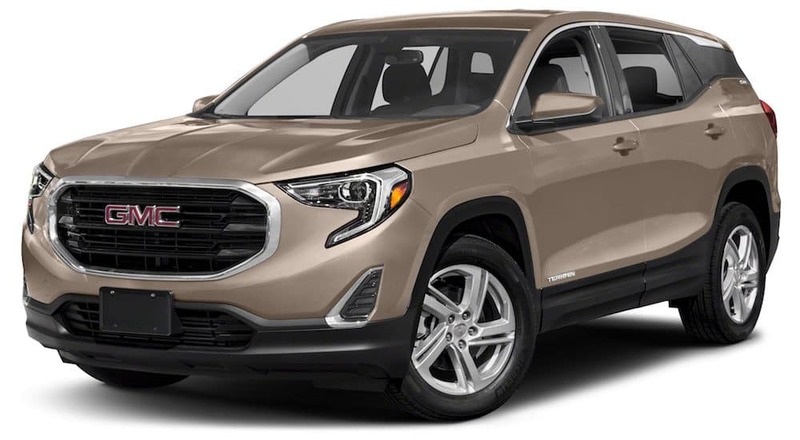 Measuring to be 182″ L x 72″ W x 65″ H, the 2019 GMC Terrain is actually surprisingly the smallest of the three current SUVs manufactured by GMC, the experts on large vehicles. That being said, it is still a utility vehicle and as such will offer drivers plenty of space passengers and cargo. The 2019 Terrain can house up to five passengers and still grant you 29.6 cubic feet of cargo space for all your gear, shopping bags or luggage. Kick out three of the passengers and easily fold down the rear three seats, and you will now have up to 63.3 cubic feet of space at your disposal to prepare for an even bigger adventure. You will also be able to get a SkyScape sunroof the stretches to the rear seating in order to really open the space up and allow you to get some fresh air and natural warmth. The exterior design of the 2019 GMC Terrain is both bold and refined in a way that allows it to appeal to a large variety of drivers. GMC still proudly displays their logo front and center on the Terrains assistive grille, and the C-shaped lights in front and rear are as stunning as ever with excellent visibility. If you are looking for something a bit more unique though, the 2019 GMC Terrain does offer a Black Edition which takes all the trimmings such as the mirrors, tire cap, roof rails, and other accents and darkens them up with a refined shade of black. Drivers also have the option to make the paint color of their vehicle black, but there are four other exterior colors that you can choose to go with all the fierce darkness that will make a strong impression day or night. The design of the 2019 GMC Terrain is impressive in that it manages to have a style that is appealing to a variety of drivers by being both sleek and aggressive, while still being able to keep its efficiency. 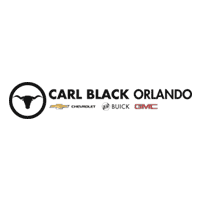 At Carl Black Orlando, we pride ourselves on our ability to make the car buying process fun again. For years buying a car has been viewed as a burden people simply must endure, but Carl Black believes that getting something as exciting as a new personal vehicle should be, well, exciting. Researching is always the first step that causes a headache for many drivers, but at our dealership, we will be happy to not only offer our resources to you, but we will even listen to your needs and literally guide you directly to the best vehicle within your price range. The second wave of frustration comes when negotiating a deal and trying to determine how much is too good to be true, but at Carl Black, we have a 100% transparency policy that assures you that we will never give you false information. We know that your time is important to you, and we would never want to waste a second of it. Our buying process allows for the quickest and cleanest route to getting you back on the road with a feeling of satisfaction, and hopefully excitement at your new investment.